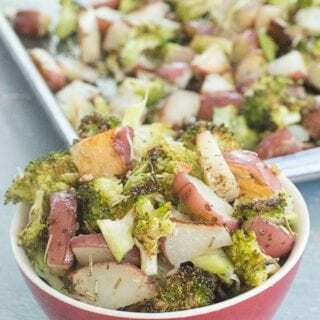 Roasted Broccoli and Potatoes are a Very Simple Combo of Healthy and Comfort Food. They are Roasted with Tons of Garlic, Oregano, Parsley, Thyme and Pepper. Every recipe I have made with “tons of garlic” has been a giant hit. Case in point: My Pizza Sauce recipe. This recipe has fresh veggies roasted and pureed, but, is that the motivating factor? It is the “tons of garlic” which has made all of you drool. I have had readers tell me that they made my pizza sauce and garlic bread recipes for the same meal! Those 2 recipes combined have enough garlic to wade away vampires for 10 lifetimes. Second case in point: my garlic butter potatoes. Nobody cares so much about the butter but the “tons of garlic” really gets them to sit up and take notice. So, I feel it is safe to assume that all of you are ginormous fans of garlic. I wouldn’t be surprised if I saw you consume it with every meal and even as an afternoon snacks. I don’t see anything wrong with that!! 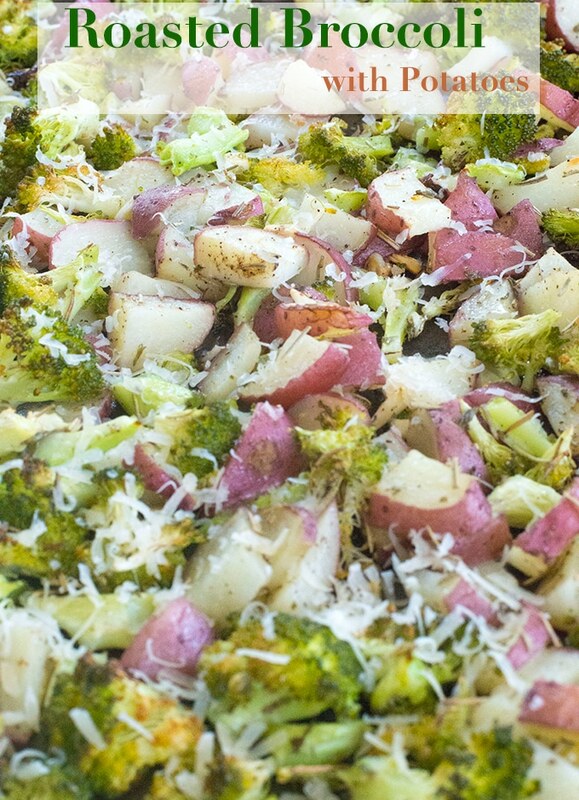 The broccoli and potatoes go into the oven like this…. ….. and come out looking like this! Have I succeeded in making you drool uncontrollably? 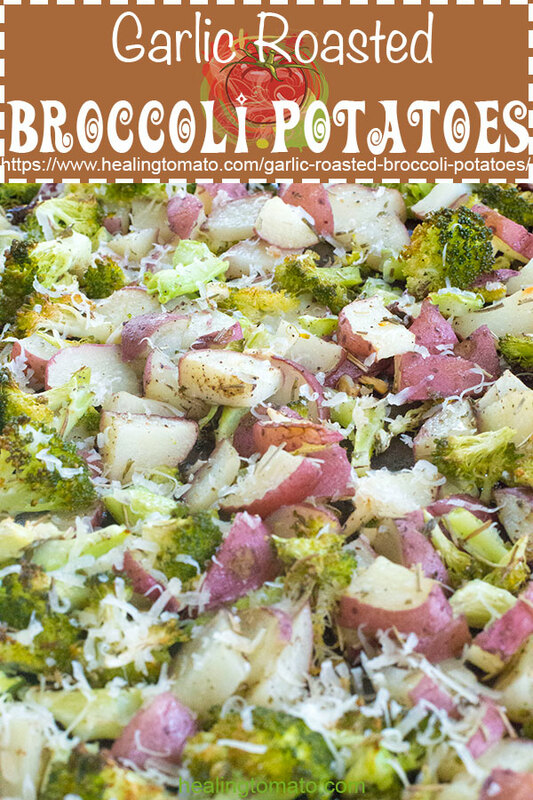 For any broccoli recipe, adding a little comfort food always makes even the broccoli haters love the recipe. 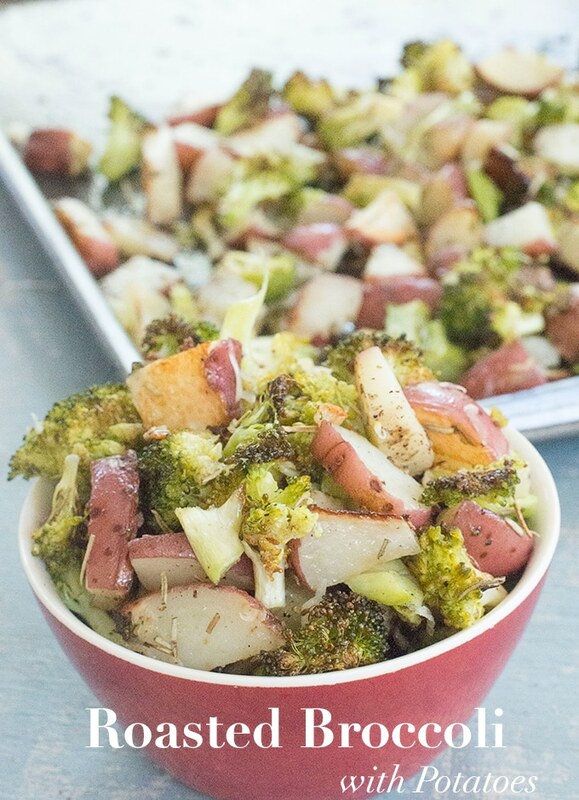 In this case, the potatoes will lure them into eating these roasted broccoli. Related: Try my Broccoli Casserole recipe. 15) Grate Parmesan directly onto the veggie. (Affiliate Link) Go Veggies makes a great vegan Parmesan cheese. 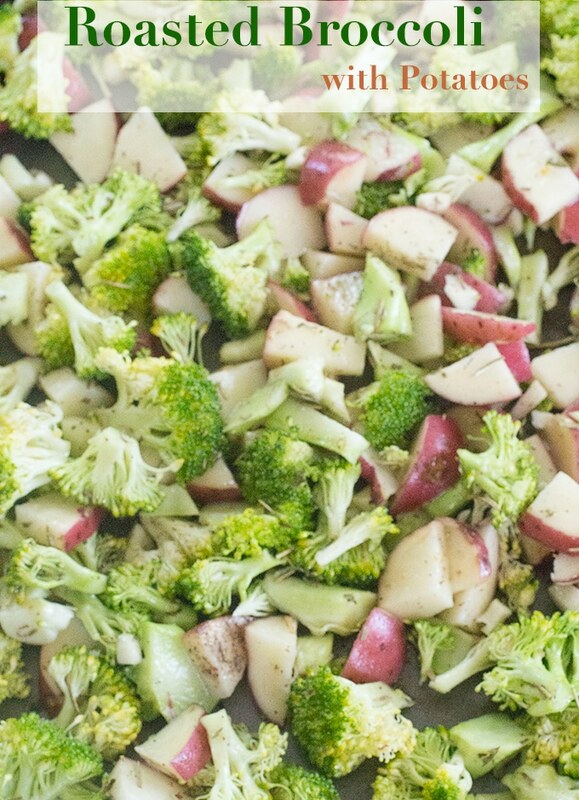 Serve these roasted broccoli and potatoes immediately. I make something similar and it is a favorite in our household all the time, especially with the kiddo! 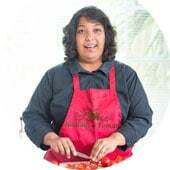 Rini, I grew up with a broccoli and potato dish. While this is very different, my grandmother’s was a boiled kind of thing, this brings me right back to that time. Love it. I just brought home some beautiful big garlic from the farmer’s market today, this would be a great dish to highlight it. Oh yes, no vampires in my house! 😀 yum, yum, yum – all I need is a spoon to dig right in – recipe looks fantastic, pinning to save! !